Before this summer, all I really knew about Atlanta was that it was the worst traffic to drive through on our way from Florida to Wisconsin (or vice versa). But all that changed when I had a chance to visit Georgia's capital with my kids. My extended family was vacationing in the mountains of northern Georgia for a week of togetherness and relaxation, and one of my 5 sisters was flying into Atlanta a few days into the trip. We decided to make a day of it when we went to pick her up. Since I'm the travel writer of the group, I was in charge of mapping out our itinerary. I was a little over-ambitious about what we could all fit into our day, and I definitely didn't account for the traffic coming into the city (rookie mistake), so we got a later start than I had hoped. Despite my miscalculations, we ended up having a wonderful time exploring Atlanta. I will admit that we definitely stuck to the tourist attractions because we were limited on time. 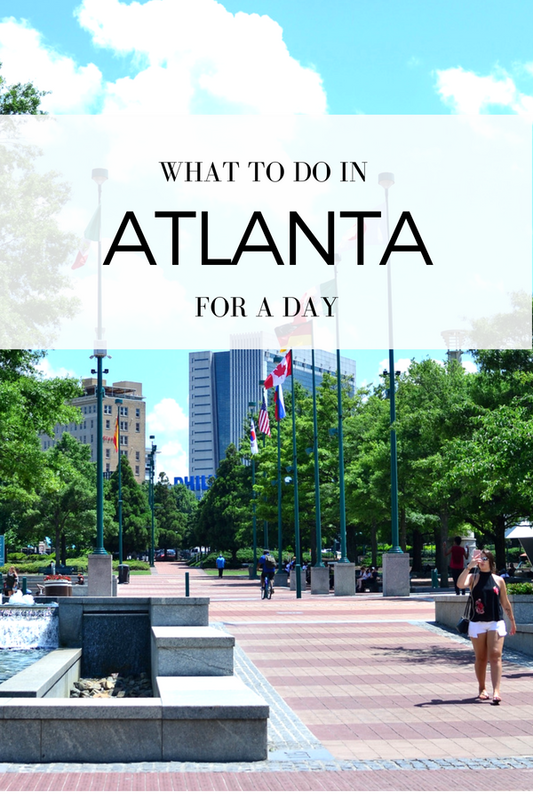 This is an overview of a few can't-miss spots in Atlanta, and I'll try to throw in a few items that we wanted to see but ran out of time for. You can certainly try out those items yourself if you're staying longer than a day! This was our first stop in Atlanta, which ended up being the perfect place to park our car while we explored the city for the day. Once inside, the tour began inside the Coca-Cola Theater with the film Moments of Happiness, which followed multiple groups of people through some of the happiest or most thrilling moments of their lives. Sure, it's kind of just a giant commercial for Coke, but I was actually almost in tears by the end of the film. I blame it on my kids - I was never this sappy before becoming a mom. Anyway, once the film is over, you're free to wander about the World of Coca-Cola checking out the exhibits, memorabilia, and displays. I wanted to stop and read through everything, but I was also chasing a 14-month-old and trying to keep a 2-year-old occupied, so I felt a little rushed. On the plus side, there was plenty of space for them to wander and explore. The very best part of the World of Coca-Cola is the tasting room at the end. My 5-year-old was in seventh heaven. Guests can sample over 100 flavors of soda from around the world, with dispensers spread out in a large room. Yes, I cringed with every tiny cup of soda she filled up, thinking of all. that. sugar, but it is an experience she still talks about months later. So worth it, right? 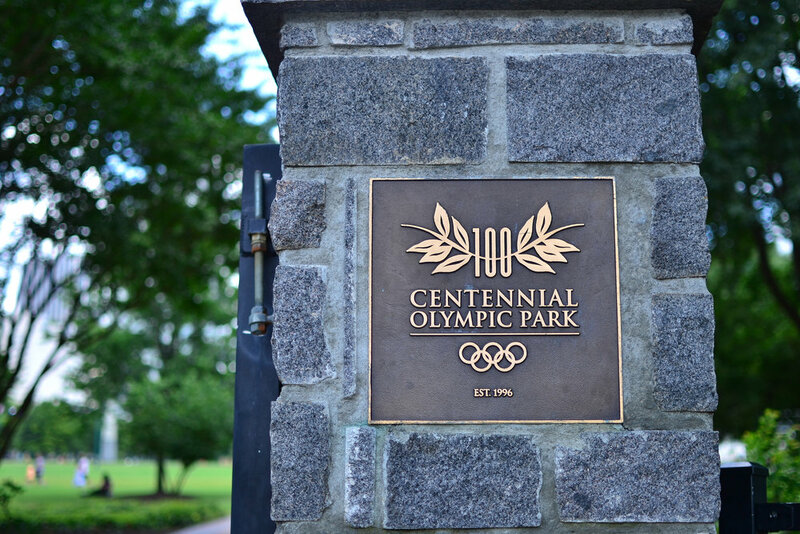 This sprawling park in the middle of the city was built for the 1996 Olympic Games held in Atlanta. My kids loved the 2 playgrounds found right at the entrance thanks to the roller slide, bongo drums, and armchair swings. If you keep walking past the playgrounds, you'll get a beautiful view of the Atlanta skyline, which served as the perfect Instagram spot for family pictures. Lastly, you'll come upon the Fountain of Rings splash park where water fountains are set to music multiple times a day, and kids can play in the water to cool off during hot summer days. I would have happily spent way more time at this park if we weren't trying to cram so much fun into our day! Bring a picnic lunch or grab an ice cream and stroll through the park. My middle child is obsessed with sea creatures, especially sharks, so I knew we had to make a stop there. One thing you need to know is that the Georgia Aquarium is vast, so plan on taking a few hours here if you want to see everything! Our favorite exhibit was the Ocean Voyager gallery, mainly because of the 4 whale sharks and giant manta rays swimming above us in the acrylic underwater tunnel. My son was in absolute awe of the gigantic creatures, and I actually was, too! We've been to quite a few aquariums, and this moment specifically stood out to us. You'll definitely want to bring your kids to the Aquanaut Adventure exhibit which is interactive and has educational activities to keep them busy! Also, check out the Tropical Diver gallery for mesmerizing jellyfish and a brightly colored coral reef. Of course, there are multiple options for interactive experiences at the Georgia Aquarium, such as the penguin or dolphin encounters, swimming with the whale sharks, or even diving with the whale sharks. Naturally, these experiences cost extra, but if you've got the time and money, they seem truly memorable. This is a fun experience where your ice cream is frozen using liquid nitrogen, and it tastes amazing! 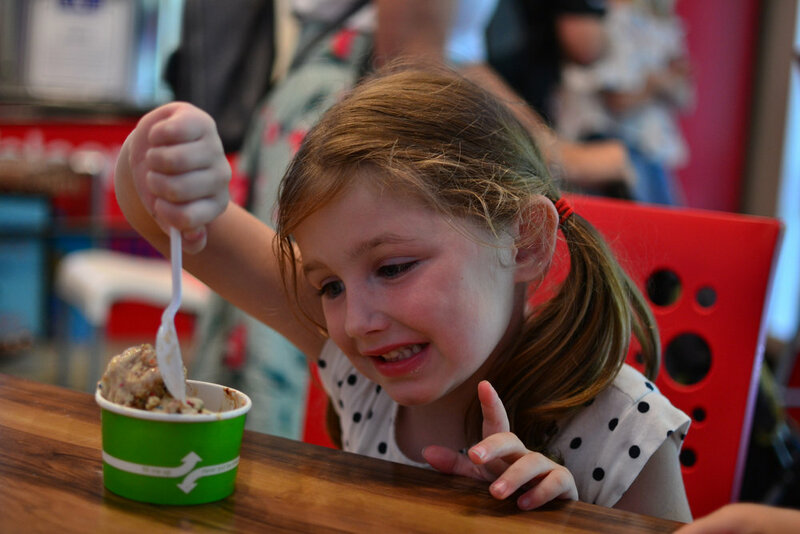 We had a blast stopping here for a frozen treat with the kids, and would highly recommend it! Our last stop in Atlanta was a visit to the affluent Buckhead neighborhood. We loved driving through the winding neighborhoods of sprawling mansions and plantations. It's a truly beautiful and peaceful area of the city. Try Atlanta Memorial Park for a great place to take a walk if your kids need a break from the sensory overload of the downtown area. You can also shop and eat in Buckhead Village, the Rodeo Drive of Atlanta. There are plenty of upscale shops and fancy restaurants, so if your kids are a little older and you're not worried about them having a meltdown in the middle of an expensive store, then this might be fun to check out! All in all, I thought Atlanta was a wonderful city with lots to do. So much to do, in fact, that I could have used another day there to try everything on my list! Here are a few spots we wanted to visit that we ran out of time for. Perhaps we'll be back soon to check it out! If you're going to visit multiple attractions, you'll definitely save money by grabbing a CityPASS, so make sure to check it out here! Also, if you're spending some time in Georgia, make sure to head to Savannah for the day. Here are my tips for experiencing Savannah in a day! What did I miss? 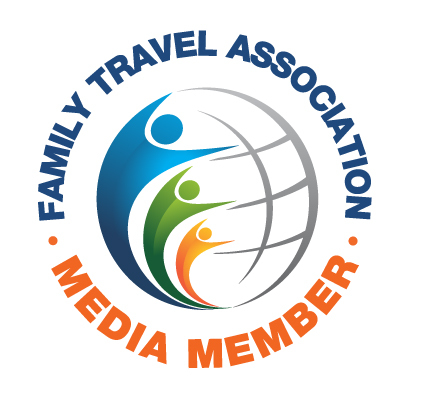 What do you love doing with kids in Atlanta? Sign up for the Exploring Moms newsletter for more!